In November, Memory and Straw won the prestigious Fiction Book of the Year Prize at the Saltire Society’s Literary Awards. Here we meet protagonist Sebastian, who lives in Manhattan and works in Artificial Intelligence. It started simply as part of my work. Technology has developed so rapidly that it’s difficult to remember we grew up without any of this assistance. My dad used to take me fishing, and the best thing was simply making the rods: gathering fallen bits of branches from the forest, then whittling them down by the stove on the Friday evening. Hazel was best. It was pliable, yet firm. After a while it moulded into the shape of your hand. I now know that my ancestors had other means of moving through time and space, and the more I visit there the simpler it becomes. For who would not want to fly across the world on a wisp of straw, and make love to a fairy woman with hair as red as the sunset? The more I discover, the more I like the precision of their world: to dream of your future husband, you pluck a few ears of corn with the stalk and place them with your right hand under the left side of your pillow. Threshed corn will not do. Exactitude was important. Otherwise, the magic wouldn’t work. If you made a clay corpse it had to be in the image of the person you wanted to harm. You pierced the body exactly where you wanted the ailment to strike. Curses, just like blessings, were specific. Once extracted from their native heath and time they don’t work. I work in nanotechnology, which is where my drive for precision found its home. There is no room here for approximation. As the old divines would have put it, things are either right or wrong. One binary digit equals the value of zero or one, and so eight bits equal one byte and one thousand and twenty-four bytes equal one kilobyte and so on up to my good friend the petabyte which equals 1,125,899,906,842,624. None of it ever varies or hesitates with doubt. It is perfect music. Over the past two years I’ve been the lead engineer on masking for the care industry. The franchise is owned by a Japanese company, but they’ve subcontracted the work out to our branch here in New York. It’s a growing industry simply because people get older by the day. I won’t tire you with the statistics, but the demographics look good. In the next decade alone the number of over eighties is due to quadruple throughout the world, with the biggest market developing in the far east itself. My job is to put a human face on the robots who will care for that generation. As a mark of respect for the great man, we call the central machine Albert. Despite all our technology, humans cling on to their traditions. Old people especially like the familiar. They like routine, a safe process which keeps death at bay for a while longer. Even though our robots can run every care home far more efficiently that any nurse or carer, the residents still want to see a human face in the morning serving them breakfast, and last thing at night tucking them into bed. So we’ve made our robots human; have developed lifelike masks which have deceived even the young in experiments. If something looks human, it is human. My line manager Hiroaki Nagano put it straight to me the very first day. It’s not just an engineering problem. The real challenge is aesthetic. Creating mask-bots which are not only lifelike, but lifelike in a familiar, flawed way. For beauty is in the eye of the beholder. Apart from a few perverts and perfectionists, most of the old people we cater for prefer carers as fragile as themselves. If you really study the human face you’ll discover that it’s perfectly imbalanced. Most folk imagine that the nose is halfway down the face: in fact the eyes are the halfway point. What comforts us is human imperfection. A face is nothing without its history. 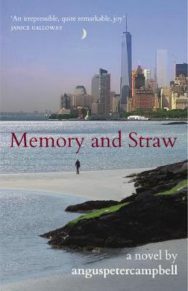 Memory and Straw by Angus Peter Campbell is out now published by Luath Press priced £12.99. The book won Fiction Book of the Year at the 2017 Saltire Society’s Literary Awards. A fun guide to knitting Scotland in miniature from William Wallace to Nessie and more!